The UnForm server manages the operation of an Apache web server, which provides browser access for server management and document libraries when archiving is enabled. On Windows, this server is bundled with the server install. On Unix, there must be an Apache server available on the system. Apache is generally pre-installed on any Unix or Linux system, and is readily available from the operating system vendor if it is not already installed. When installing on Unix systems, the ufsetup.sh script will look for the Apache server at several standard locations. If not found, it will prompt for a path to the httpd executable and also the Apache home directory where its 'modules' directory is located. 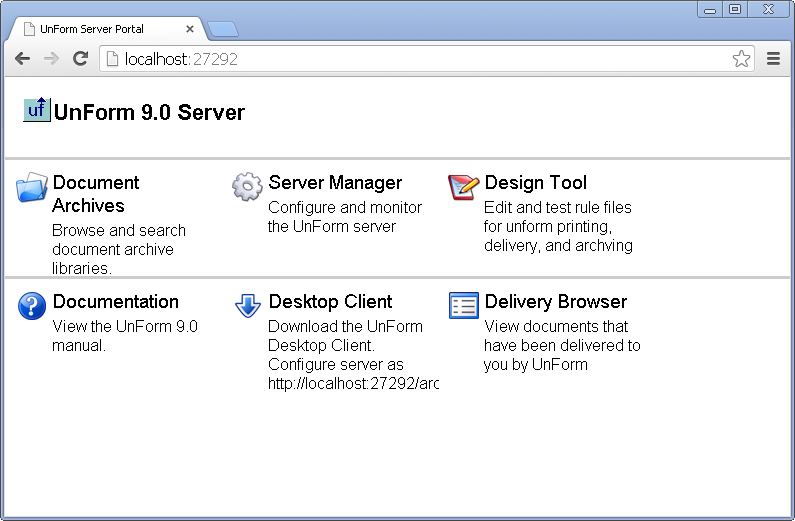 This will open the UnForm 10.0 portal page on the address specified, which provides links to other browser-based features of the UnForm server. Most options require a login. Logins consist of a user ID and password, and are defined in the Administrator options of the archive browser interface, which are available when logged in as an administrative user. When the system is initially installed, there will be one administrative user pre-defined, user ID of "admin", password of "admin". Use this login to manage this and other users. Often, the UnForm server is behind a router in a private address space. To access it from the internet requires configuring the router to forward a router port to the UnForm server address and port. The router's firewall may also require configuration to allow connections to that port. The above would create a virtual host accessed by the server name specified, archives.mycompany.com. The ProxyPass directive causes Apache to retrieve all files from the 99.99.99.99 site, which represents the public address of the network where the UnForm server is installed, where port 27392 is forwarded by the router to the UnForm server machine in its local network. Under an IIS web server, you can create a new site that uses a universal URL Rewrite feature that defines a reverse proxy inbound rule to the public address and port of the UnForm web server. Access to the IIS site retrieves content from the UnForm server behind the router. See your web server documentation for reverse proxy configuration.